We’re caught by surprise sometimes on attempting things we used to do before with relative ease but now find challenging. I’m largely housebound and incapacitated by chronic illness, but I can still totter around my small home and navigate a few steps (albeit painfully and slowly) most of the time. But set my feet on concrete, ask me to pound pavement, and I’m all over the place, unsteady as can be. I have bad balance, limb stiffness, weakness and pain to contend with, which makes walking very slow, arduous at best and impossible at worst, when the territory is uneven. Years ago I realised that a wheelchair was the best mode of transport for me. Sadly, there wasn’t anyone reliably able, available and fit enough to take me out in one, so I only borrowed a set of wheels when it was absolutely necessary. I made a trip to the city recently and thought I would try to get there by bus, knowing how hard it can be to park the car. I wanted to try stretching my limbs and limits (maybe you can relate?) in the vain hope of being able to accompany my grandson home from his first day at school next week. Dear reader, I struggled. Pain was severe and I nearly cried out loud. I halted several times and barely covered one third of the necessary distance to reach my school collection goal. We caught a taxi home. Later on, as I sat with frustration, I looked at my photos and wrote a poem about the experience. It was a surprise grace gift, arising from a hard thing, such as God delights to provide for you and me. Things don’t seem so bad when viewed from God’s perspective. I can’t manage the walk but I can be the one welcoming our grandson home at the door. God is constantly rewriting our stories, blending them into His greater narrative. What seems to be causing us to fall just might lift our souls more than we can know. I’m grateful for God’s keeping power and my dependence on Him, even if my story has taken several unwanted twists and turns. How has God met you at your point of need? 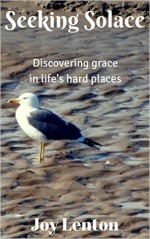 Have you been able to trace His hand in the hard experiences of life? Let’s encourage one another in the comments below. I know about pain, it is something that is hard to count as joy as the Bible says, but I have had to, and while I kow pain I know healing also. I hope you find strength to not ever have to settle for a wheelchair. Are you aware of the new upright walkers that let you stand and rest your arms on it, they are not like walking bent over. I know you are in England, but they advertise them in the states. Let me know and I can find you a link if you’d like. I’m so sorry things keep getting more challenging for you, Joy. I admire you though for stepping out in fear. I love this – “It was a surprise grace gift, arising from a hard thing, such as God delights to provide for you and me.” Yes, His perspective makes it so much better. Those surprise grace gifts usually do arise through painful experiences, don’t they? I hope you are rested since your trip. It’s hard to believe your grandson is old enough to go to school already! Love and hugs to you!